Creative Technology has launched what it claims to be the "world's first sound card with an integrated RGB controller". 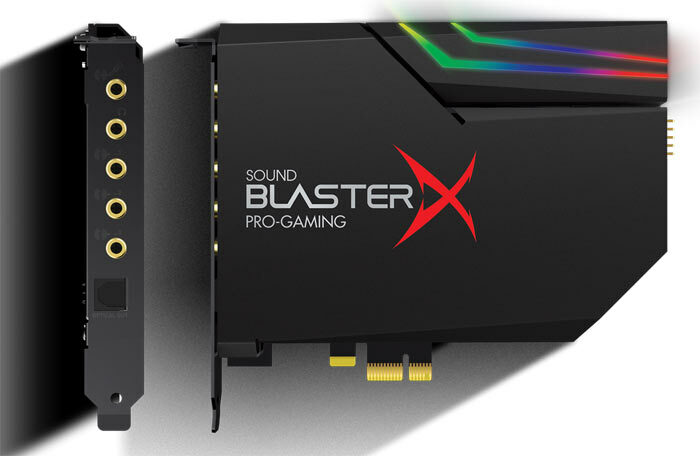 The Sound BlasterX AE-5, which is is a PCIe card, has both its own on-device RGB LEDs and an Aurora Reactive Lighting System with which you can connect and control 4x RGB LED lighting strips. For its audio duties the Sound BlasterX AE-5 combines a 122dB 32-bit/384kHz ESS Sabre DAC a custom-designed 600Ω discrete headphone amp, "audiophile-grade components", and proprietary Sound Blaster audio enhancement technologies. Discrete headphone amps are increasingly popular as many headset users appreciate the audio fidelity delivered using such purposely designed hardware. With its Xamp, Creative says that "the ultra-low 1Ω output impedance drives 16-600Ω headphones perfectly." Inside the headphone amp are German-made WIMA film/foil capacitors. Behind the audio abilities of this sound card is the ESS Sabre32 Ultra Class PCIe DAC. It delivers up to 32-bit 384kHz playback with discrete 5.1 or virtual 7.1 support. Low-noise figure of 122dB DNR are claimed. Audio processing is handled by the BlasterX Acoustic Engine suite, which includes 3D sound effects for speakers and headsets and there's Crystal Voice sound enhancement available too. For gamers Creative boasts of the Scout 2.0 enemy audio radar overlay, said to be especially useful for FPS type games. 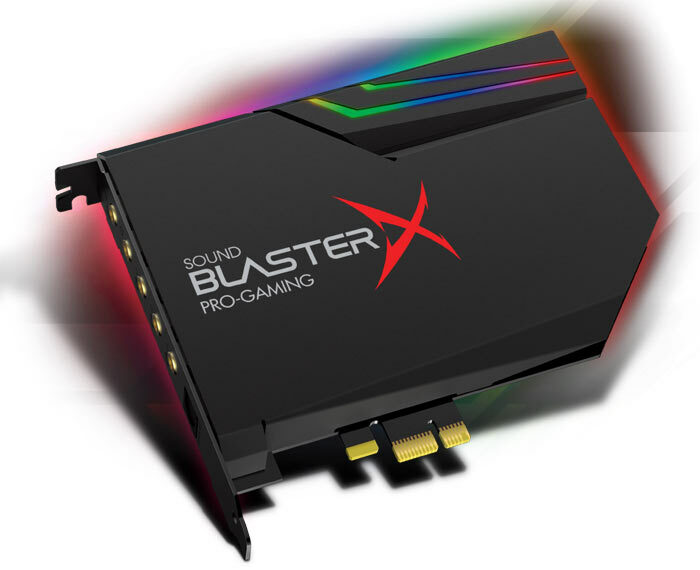 Creative appeals to users looking for value, as it asserts buying the Sound BlasterX AE-5 makes it unnecessary to splash out on a "separate RGB lighting system which could set a user back by at least USD 50". Creative's Aurora Lighting System lights up this PCIe card and up to 4x LED strips. Software can then be used to choose from multiple presets or program it with up to 16.8 million colours and various LED illumination rhythms. The lighting system requires the connection of a 5V 4-pin molex peripheral connector from your PC power supply. The standard Creative Sound BlasterX AE-5 is black and comes bundled with a single 30cm RGB LED strip containing 10x LEDs. A 'Pure Edition' is also being made available in white and with 4x RGB LED strips in the box. Availability of the standard card is scheduled for July costing $150, with pre-orders in the US open now. The Pure Edition is set to retail at $180 and becomes available in August as a Creative.com exclusive. Oooo lights. Worst thing about my Sound Blaster Z is the super bright red LED. Been meaning to go in there with some wire cutters and snip the thing off. I was disappointed that I could never get digital surround to work with the Sound Blaster, and I bet that it's the same with this one. The latency AC3 encoding generates means the sound lags your screen, which is very irritating for gaming. Doesn't look any of their hardware actually handles this very well. How much remains to be done as far as consumer sound cards are concerned? I mean, if your marketing tag line boasts an RGB controller then I'm guessing “very little”. Surely most who would be willing to purchase an RGB filled “pro gaming” soundcard would most likely already have an RGB filled “pro gaming” motherboard with perfectly adequate on-board sound? Back in the day a dedicated card would be great for DJ mixing or whatever if you needed the extra channels, but as above, I've not really understood the need for a dedicated card for many years unless I am missing something drastic. I also would have thought that anybody needing something more professional than modern on board sound would be using completely different equipment in general anyway? Still using my x-fi gamer.